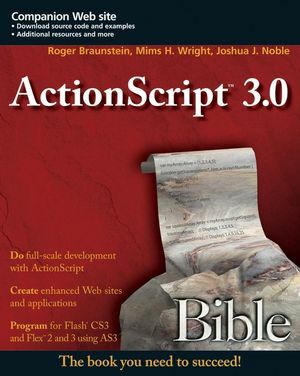 This description refers to the first edition of ActionScript 3.0 Bible. For the greatly revised and updated second edition published in April 2010, search on author Roger Braunstein’s name or for ISBN 0470525231. ActionScript has matured into a full-fledged, object-oriented programming language for creating cutting-edge Web applications, and this comprehensive book is just what you need to succeed. If you want to add interactivity to Flash, build Flex applications, or work with animation — it's all here, and more. Packed with clear instruction, step-by-step tutorials, and advanced techniques, this book is your go-to guide to unlock the power of this amazing language. Learn the basics, apply object-oriented programming, and more. Roger Braunstein is the Director of Technology at Your Majesty. He is an ActionScript veteran, multidisciplinary programmer, and author of a short book on Flex 2. He has done a wide variety of projects for clients large and small, as a leader, developer, and animator. Mims H. Wright is a senior Flash and Flex developer based in Brooklyn, NY. In his eight years of Flash experience he has worked on projects from video games to applications on and off the Web. Joshua J. Noble has worked with Flash and Flex among other technologies for various companies and clients over the past five years. He has worked on projects ranging from video applications and editors to enterprise business applications. Part I: Getting Started with ActionScript 3.0. Chapter 1: Introducing ActionScript 3.0. Chapter 2: Understanding ActionScript 3.0 Language Basics. Chapter 3: Programming with Classes. Chapter 4: Working with Methods and Functions. Chapter 5: Validating Your Program. Part II: Working with ActionScript 3.0 Objects. Chapter 7: Working with Numbers and Math. Chapter 10: Working with XML. Chapter 11: Working with Regular Expressions. Part III: Working with the Display List. Chapter 12: Understanding the Flash Player 9 Display List. Chapter 13: Working with DisplayObjects in Flash CS3. Chapter 15: Working with Text and Fonts. Part IV: Understanding the Event Framework. Chapter 17: Working with Mouse and Keyboard Events. Part V: Working with Error Handling. Chapter 20: Using the AVM2 Debugger. Chapter 21: Making Your Application Fault-Tolerant. Part VI: Working with External Data. Chapter 22: Understanding Networking Basics. Chapter 23: Communicating with Server-Side Technologies. Chapter 24: Saving Data to a Local Machine Using SharedObject. Chapter 25: Managing File Uploads and Downloads. Part VII: Enriching Your Program with Sound and Video. Chapter 26: Working with Sound. Chapter 28: Accessing Microphones and Cameras. Part VIII: Programming Graphics and Motion. Chapter 29: Applying Filters to Your Graphics. Chapter 30: Drawing Vector Graphics Programmatically. Chapter 32: Applying Transformations to Graphics. Chapter 33: Drawing Bitmap Graphics Programmatically. Part IX: Working with Binary Data. Chapter 34: Working with Binary Data. Part X: Deploying Your Program. Chapter 35: Deploying Flash on the Web. Chapter 37: Using Local Connections to Communicate Between Flash Applications. The following code is the VideoButton file needed to create the video button for the FLV Playback Application in Chapter 27. The download file contains the updated code files for chapter 27.